Hazard Can Be A Good Thing! Can a Hazard be a good thing? 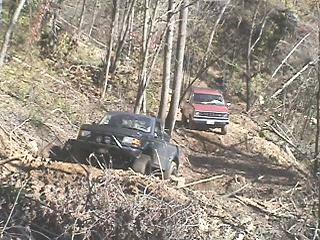 It can when your wheeling in Hazard Kentucky! 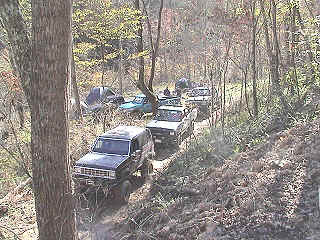 We made our yearly trip back down to Hazard Kentucky October 17-19, 2003. We finally got to the point where we can have a fun filled weekend in Kentucky without having to work on building trails. Sparkz now has a few miles of trails in and the wheeling is excellent. There is a short loop and long loop both with side trails along the way. There is a good day of wheeling to be had for the off-road enthusiast and we have some things lined up to make 2004 even better! Here are (21) photos for you to take a look at. Enjoy! Hopefully you’ll be in these photos next year.